I give Anjou Cellulite Cream 1.5 out of 5 stars. So obviously, I’m not a big fan of this cellulite product. It’s one of the many “hot creams” on the market that are intended for anti-cellulite properties like toning, detoxifying, and tightening the skin while doubling as a sore muscle relaxer and soother. Unfortunately, this one really didn’t do ANY of what it said it would. My only results were that my skin felt tighter. It honestly felt like it was just drying out my skin. And it was more of an annoying tingle rather than a muscle relaxer. Some of these hot creams really do help with my aches and pains but sadly this wasn’t one of them. It’s a super cheap product and the quality reflects it. Luckily, I didn’t have any side effects or reactions to it. It does say that it’s 87% organic, so that’s always a bonus for me and for many of you. But the application process is messy and the smell is SO strong like a supercharged menthol stick. So all in all, I’d give this one 2 thumbs down and suggest moving on and trying another product instead. Anjou Cellulite Cream is a gooey, orange-colored gel. It has a watery, slick, pudding-like consistency to it. Ugh, I’m never a fan of these “hot cream” applications. The gel itself goes on fairly easily. But it comes in a wide mouth jar, so you have to repeatedly dip your fingers in the jar and that’s just so unsanitary to me. Yucky! You’re going to apply the cream twice daily to all of your problem areas. I put it on my belly, bum, thighs, and arms. It also suggests applying it before working out and even wrapping it for optimal results. Make sure you wash your hands immediately after applying and don’t let it get into your eyes or on your face, sensitive areas, etc. About 10 minutes after applying it I got SUPER cold and had goosebumps. That’s right about when the “tingling” sensation sets in. It gets really annoying, especially having to apply it twice a day. So it takes about 10 minutes or less for the gel to physically dry. BUT it leaves you feeling very cold and tingly. The tingling sensation lasts for an annoying 1 to 2+ hours. As with most “hot creams”, it has a very strong menthol/vapor rub smell. I think it’s so gross and so potent. It can definitely give you a headache, especially if you’re sensitive to stronger smells. After applying, the menthol, Vapor Rub smell lingers with you for a few hours afterwards. I hate the smell and it’s so overpowering. I felt like everyone around me could smell it. It actually felt like it dehydrated my skin, not good! Usually at a bare minimum cellulite creams can at least provide some moisture and help soften skin. But I didn’t see that at all with this one. After using this product long term, I noticed that my skin felt tighter. However, there was no noticeable improvement in the appearance of cellulite. As for a muscle soother and relaxer, I’d say it’s just okay. It’s more of a tingle and not really an icy/hot sensation like other cellulite hot creams. So it didn’t even help my achy muscles, which I have plenty of them due to a bad back and constantly tight legs and shoulders. But it might help if you just have lightly sore muscles, as opposed to moderate or severe. But honestly you’re better off just getting a cream like icy/hot if that’s more of what you’re looking for. 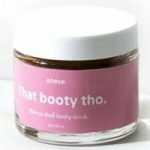 This cellulite product has a huge list of ingredients. I’ll try and pick out the most notable and beneficial of them. It does say that it’s 87% organic, so that’s always a plus in my book. It has Organic Aloe Leaf Juice, which is thought to decrease inflammation and improve hydration and skin suppleness. Menthol Crystals and White Camphor Bark Oil are used to create the heated/tingly, muscle relaxing effect. Menthol may help increase blood circulation and help tighten the skin. Meadowfoam Seed Oil is thought to diminish inflammation and pump up hydration to help smooth and soften the skin. Anjou puts a ton of emphasis on the addition of L-Carnitine. This ingredient may be particularly beneficial because it’s believed to aid in the breakdown of free fatty acids and turn them into useful energy. It’s thought to have a topical effect like that of a local metabolism booster, which may help shrink fat cells. Black Pepper Oil is known for improving circulation. It may also help tone and clear pores, making skin affected by cellulite look better. You get a pretty big 16 ounce jar for $17.99 on their website (which actually redirects you to their Amazon page). It works out to only $1.12 per ounce. It honestly doesn’t get much cheaper than this per oz.! But unfortunately you seem to get a quality that reflects the cheap price. As a side note, I went back to their website to get links for the review and it has a “Buy On Amazon” button but for some reason it’s currently unavailable. I looked around and you can’t really buy it anywhere else online. I did find it on eBay but it was much more expensive. So I’m not sure what the deal is here! It’s very strange. I can’t find a guarantee anywhere on the Anjou website. They also don’t have any information on return/exchange policies. To buy Anjou Cellulite Cream, click here.